Home > Nations & Zones > U.S.A. The United States of America has and has had many domestic chess clubs. The club that became the first ICCF affiliate, The Correspondence Chess League of America (CCLA), had an international background. It was a merger of 4 clubs in 1917, one of which was a Canadian club. The number of Canadians in CCLA diminished after the Canadian CCA took over the Canadian CC Championship. CCLA accepted the invitation of the International Correspondence Chess Association (ICCA) to become a member in 1946. Participation began in 1947 with a team of 100 players competing against teams from Belgium, England, Finland, France, Holland, and Sweden conducted by ICCA. The first time the US was invited to play in an ICCF Olympiad event was in 1958. This was the Final Olympiad III team tournament in which the USSR was also invited to enter a team for the first time. Walter Muir took over the CCLA post of ICCF-US Secretary in 1969. Muir started playing chess in 1917 and didn’t stop until shortly before his death in December 1999. Muir’s father was Canadian. As a result, Muir was active in both US and Canadian chess. He won the Canadian CCA championship 8 times between 1928 and 1942! He is the first native born American to earn an ICCF Master Title. He had 552 games rated by ICCF at the end of 1999! He was awarded an Honorary Membership in ICCF in 1998. Muir’s promotional efforts increased US participation in ICCF events. He worked with John Cleeve of Canada to establish an ICCF North American Championship Invitation Tournament with five Canadian and 10 USA players to be selected by the ICCF Secretaries of both countries. The North American Champion would be seeded into the World Championship Final. Today the winner is entered in only the ¾ final. The 1970 ICCF Congress agreed to this. The winner of the First North American Invitation Chess Championship was Robert Cross of United States in 1971. In 1974, John Cleeve was the first North American to attend an ICCF Presidium meeting in Nice, France. The ideas exchanged allowed both countries to create opportunities for their players. Walter Muir realised that the USA needed an ICCF affiliate that could represent members of all US clubs. He created the United States Postal Chess Union (USPCU) to be that US affiliate. He drafted a constitution with a President and Advisory Council with himself continuing as ICCF-US Director. Muir also began recruiting top non-CCLA players to compete in ICCF events as well as to compete in the CCLA member only US Championship. The cost of the USPCU operation was borne entirely by the fees paid by US players participating in ICCF events. This did not solve all the problems since CCLA was still the official delegate to ICCF. By 1977 CCLA also presented a draft of an “umbrella organisation” that was acceptable to ICCF. The United States Postal Chess Federation, USPCF, became that organisation with its own constitution. Initially it provided access for international postal play for members of CCLA, United States Chess Federation (USCF), and American Postal Chess Tournaments (APCT). Knights of the Square Table (NOST) and The Chess Connection (TCC) later joined. Robert A. Karch served as ICCF-US Secretary for over 5 years. The organisation had financial problems in part because it could not charge membership dues to cover the increasing ICCF dues. The US was faced with the possibility of being dropped from ICCF because of this and because of problems with some players. There was a meeting in Chicago of USPCF with all major organisations in attendance. It was unanimously proposed that Max Zavanelli become Secretary. The USPCF Constitution would be in force. Max Zavanelli took over as ICCF-US Secretary in June 1987. He was faced with the challenges of putting USPCF back in good financial standing and of enforcing a new dropout policy because US players had caused problems in several tournaments by dropping out silently. Zavanelli was the first ICCF-US Secretary who could regularly attend ICCF Congresses and who became active in ICCF affairs. When Max Zavanelli took over, Victor Palciauskas was the only active GM as Hans Berliner had then retired from correspondence chess. There are now 3 active GMs; Alik S. Zilberberg earned the title in 1994 and Joseph A. de Mauro in 1997. Of the 7 Americans who had received IMs through 1988, only three were active. By 2001, 54 Americans had received IM Titles and 43 are still active. Two ladies, G. L. Finegold and Dr. C. A. Rosenfield, have attained the International Ladies Master title since 1988. Nine of the IMs have earned their Senior International Masters. The number of International Arbiters increased from 3 to 9 under Zavanelli. The US IAs are D. R. Adamson, Dr. G. S. Benner, Dr. T. Bullockus, M. Carter, T. Dougherty, A. A. Jones, B. Koppin, A. Wright and Prof. M. Zavanelli. USPCF under the direction of Max Zavanelli organised the First National Team Championship Tournament early in 1991. USCF, CCLA, APCT, TCC, and NOST each entered a team on 50 boards. Dr. G. S. Benner, ICCF International Arbiter, was Tournament Secretary. The event one off event was won by APCT. The United States of America has had 2 World Champions. The first, GM Hans Berliner, won the Fifth World Championship in 1968. He was one of the top over-the-board players in the 1950s when he switched to correspondence chess. He won the Championship the hard way – by qualifying through a series of preliminary events – at a time when very few top US players were active in ICCF. Unfortunately, he decided to retire from his correspondence chess career at the top. He is the first person to be initiated into the (US) Chess Hall of Fame based on his correspondence record of 90 wins, 8 draws and 1 loss. GM Victor Palciauskas won the Tenth World Championship in 1984. He was nominated for a vacancy in the Finals because of his excellent performance in the North American Invitational Correspondence Chess Championship II. He had earned the GM title in 1983. 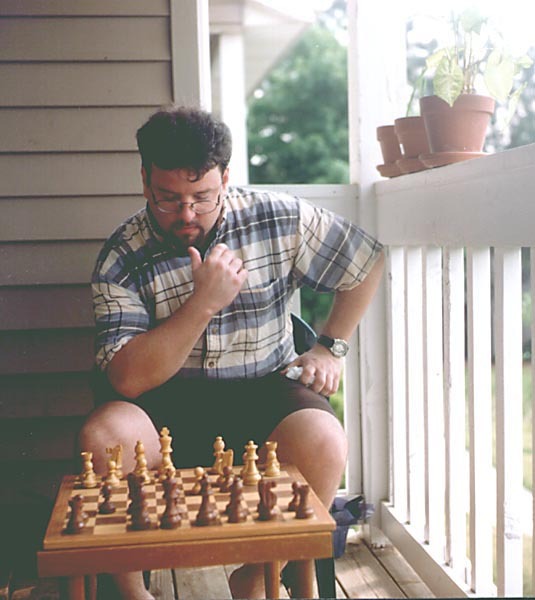 He had continued to play over the years, and participated in the First Email Correspondence Chess Championship. Both champions have indicated in interviews that winning the World Championship takes a tremendous amount of hard work as well as the desire to win! GM Hans Berliner came out of retirement in 2001 to play in the Jubilee World Champions’ Section. Victor Palciauskas also played in this event taking second position. Detailed results are placed in the table at page “ICCF 50th Jubilee Tournaments“. The ICCF affiliate has the right to hold national championships. Plans for such a championship were begun in 1969 but the first tournament did not begin until July 1, 1972. It was probably the first tournament in the USA to use ICCF time controls. It is played in two rounds with new preliminaries beginning every 2 years. At first only the Final was rated by ICCF. After 1980 USPCF began conducting the USCCC beginning with the Fifth USCCC. It is open to players of all US clubs. A rating of 2000 or higher is required now. The winner qualifies for the World Championship semi-finals. Originally it was hoped that there would be 15 sections with 15 players. The winner of each section would then play in a final 15 player round. Over the years the number of entrants dropped and the format had to be changed to accommodate the smaller field. When Max Zavanelli took over as ICCF-US Secretary, one of his goals was to make this the premier US event again. Beginning with the Final Round of the 8th USCCC, he invited all former USCCC champions to participate. Previous champions had not competed, as they did not want to go through the preliminaries again. He invited each of the US correspondence chess clubs to nominate their champion to represent their club in the final. This made the field larger and much stronger. This made the 8th USCCC one of the strongest correspondence chess events held in the United States. Play is currently underway in the 14th, 15th,and 1st email championships. Zavanelli has done much to promote the USCCC over the years. He is now famous for his quote: “This is the United States Championship, not tiddlywinks”. 1st R. Anthony Cayford; 2nd Dr. Eugene Martinovsky; 3rd Dr. Victor Contoski; 4th Curtis W. Carlson; 5th Paul T. Fielding and Kiven J. Plesset; 6th Robert I. Reynolds; 7th David C. Taylor; 8th Marc J. Lonoff and Dr. Eugene Martinovsky; 9th Stephen Jones; 10th Jon Edwards; 11th Stephen Jones, Timothy Murray and Robin Smith; 12th Craig Jones and Konstantin Dolgitser; 13th Robin Smith, 14th Randy Schmidt, 15th Dr. Edward Duliba, 16th Lawrence Coplin and Thomas Biedermann, 17th Dr. Edward Duliba, 18 th John Ballow. The United States hosted the ICCF Congress in Daytona Beach, Florida in September 2000. This was only the second time the Congress had not been held in Europe. It provided an opportunity for the titled US players to meet and play the “Rest of the World” in a special evening chess event. Everyone had a good time, even though the US lost the match. Attendees included both US World Champions and delegates and friends from 20 nations. The Olympiad 15 team was Tim Murray, John Knudsen, Dr. Jason Bokar, Craig Jones, Dr. Michael Millstone, and James Skeels. The Olympiad 16 team (post) was Gary Kubach, Jerry Weisskohl, Keith Holzmueller, and Mihai Harabor. This team qualified ICCF-US for the Olympiad 16 Finals, now ongoing, with the team of Alik Zilberberg, Dr. Edward Duliba, Keith Holzmueller, Jerry Weisskohl, and TC John Timm. The Olympiad 17 team was Dr. Jason Bokar, Kenneth Reinhart, Keith Rodriguez, Robert Rizzo, Dr. Michael Millstone, and Corky Schakel. This team qualified for and played in the Olympiad 17 Final. The Olympiad 18 team was Daniel Fleetwood, Jerry Weisskohl, Keith holzmueller, Michael Proof, William Boucher, and Tim Murray. The PanAm 8 team was Jerry Weisskohl, Richard Fleming, Gerald Grimsley, and Corky Schakel. This team finished third, for the bronze medal. The PanAm 9 winning team was Wesley Brandhorst, Dr. Michael Millstone, Michael Proof, and Corky Schakel. The PanAm 10 team is Carl Siefring, Thomas Biedermann, John Ballow, and Anthony Kain. This team is working to defend the gold medal.